New research in the Department of Anesthesiology is aimed at understanding how the brain regulates states of consciousness. This research will lead to better understanding of pain and anesthesia, as well as disorders such as autism, schizophrenia and sleep apnea. 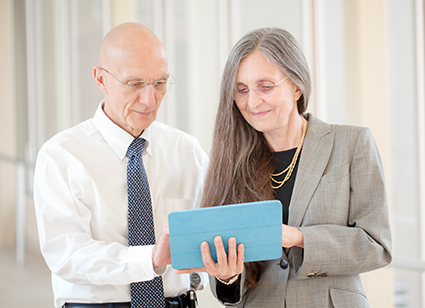 To lead this endeavor, Ralph Lydic, PhD, and Helen Baghdoyan, PhD, who are considered one of the most productive couple-collaborations in the history of anesthesiology research, have brought their skills and expertise to the University of Tennessee. They hold joint appointments with the Department of Anesthesiology at the UT Graduate School of Medicine, the Department of Psychology at the university’s College of Arts and Sciences, and Oak Ridge National Laboratory, creating an environment of collaboration among facilities with some of the most advanced technologies and researchers in the country. Dr. Lydic also serves as the Robert H. Cole Professor of Neuroscience, and Dr. Baghdoyan serves as a Beaman Professor. Their charge is to build a nationally recognized neuroscience research program in the Department of Anesthesiology by further enhancing interaction, collaboration and exchange between UT’s main campus, ORNL, and the Cole Neuroscience Center at The University of Tennessee Medical Center. "Anesthesia was named by the New England Journal of Medicine as one of the most significant medical advances in the past 1,000 years." Robert M. Craft, MD, Professor and Vice Chair of Anesthesiology, said, "Our goal is to understand how consciousness works. Anesthesia reversibly interrupts consciousness and thus offers an opportunity to study both states in the same individual. "The aim is to find a common change in brain chemicals or electrical activity across the spectrum of anesthetic agents. Whatever process goes away and comes back with the onset and reversal of anesthesia -- that is the minimum requirement for consciousness." Dr. Lydic explained why it's important to understand how anesthesia works. "Anesthesia was named by the New England Journal of Medicine as one of the most significant medical advances in the past 1,000 years," Dr. Lydic said. "Everyone who has surgery wants it, but we still don’t know how the drugs make us unconscious and eliminate the perception of pain. Understanding exactly how the drugs work is an important step toward eliminating problems like nausea and vomiting after surgery, itching, and post-operative cognitive decline in some older patients." Sleep and anesthesia are different states of consciousness but share some similar traits such as depressed breathing, poor control of body temperature, and the bizarre mental activity of dreaming. Discoveries by Dr. Lydic and Dr. Baghdoyan have led anesthesia researchers around the world to use states of sleep as a tool for efforts to understand states of anesthesia. "Sleep influences so many functions and illnesses," said Dr. Baghdoyan. "It impacts our exercise, nutrition, cardiovascular health, immune functions, emotional state, learning, memory, and our overall sense of well-being. Sleep is one of the cornerstones of good health, yet if you talk with anyone who has spent a few nights in the hospital, they commonly report that they can’t sleep through the night. We need to improve sleep in the hospital and to improve the concept of sleep health as an essential component of medicine." Before coming to the Graduate School of Medicine, Dr. Lydic and Dr. Baghdoyan established research programs, first at Pennsylvania State University and most recently at the University of Michigan, that have gained national fame for their contributions. Their research has been continuously funded since 1988 by grants from the National Heart, Lung and Blood Institute, and the National Institute of Mental Health. In 2012, the American Society of Anesthesiologists presented Dr. Lydic with its Excellence in Research Award. He is a founding member of the Society of Anesthesia and Sleep Medicine and serves on the board. In addition, he is chairman of the External Advisory Council of the National Space Biomedical Research Institute. Dr. Craft said, "We are proud to have Dr. Lydic and Dr. Baghdoyan at our research facility, and we look forward to making new contributions toward an understanding of how the brain works." 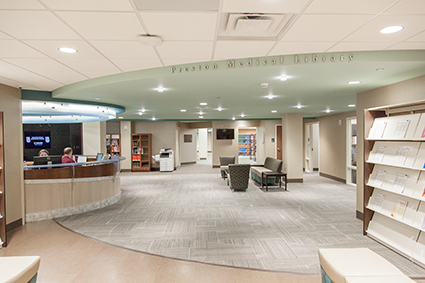 Expanding upon the resources of Preston Medical Library, a new Health Information Center opened in the main lobby of The University of Tennessee Medical Center to provide health and wellness information to patients, families and the community. It also continues to provide medical information to the physicians, residents, medical students and healthcare professionals it has served for the past 50 years. As the Health Information Center encompasses Preston Medical Library, it is staffed by professional medical librarians and library associates who are also certified consumer and patient health information specialists. The Health Information Center offers an extensive health library, digital and print resources, walk-in assistance, educational classes, and help with research on specific health conditions. The Health Information Center carries on the vision of Howard Preston, a banker with a keen vision on the importance of information and libraries. In 1967, he made a gift of $25,000 that transformed a room full of books and journals into Preston Medical Library. Today, members of the community have a new, easily accessible collection of health information delivered by expert medical librarians. The completion of the 10,500-square-foot facility marks the conclusion of a $4.1 million campaign solely supported by philanthropic dollars. Take a 360 virtual tour of the new Health Information Center and Preston Medical Library. "Dr. John Bell: Taking screenings to the streets"
"At 81, was it ethical to operate on Joan Rivers?" "UT Medical Center to open Health Information Center"
"Neuroscientist couple hired to build national research program"
"World Renown Neuroscientists to Lead Brain Research Efforts in Knoxville"
"World Renowned Neuroscientists to Lead Brain Research Efforts in Knoxville"
"New info center aims for patient education at Univ. of Tenn. Medical Center"
"Knoxville health experts help prevent the spread of Ebola"
"First confirmed case of Ebola in United States reported in Dallas"
"East Tennessee hospital says its prepared to handle Ebola virus"
"UT Medical Center credits simulation center for fast response time in last year's Jefferson County bus crash"
"Church bus crash shows importance of training"
"Simulation for mass trauma saves lives at UT Medical Center"
"UT Center for Advanced Medical Simulation Gets $300K Donation"
"Sally Jenkins to sign copies of Summitt book Wednesday"
"The dangers of painkillers during pregnancy"